Teen Mom NYC: Amaya Papaya Giveaway! I am happy to announce that we are doing our FIRST GIVE AWAY! Remember Amaya Papaya and how they helped with The Orlando Teen Mom Event, well we have partnered up to offer you all something MORE! Amaya Papaya is an indoor playground located in Casselbery, Florida. Yolanda Tyler created Amaya Papaya after having her daughter, Amaya. As a new mother Ms. Tyler wanted to be able to spend as much time as possible with her daughter but continue working. After thinking about all of the different options Ms. Tyler came up with the idea to create a space where parents and children can come and enjoy each others company. 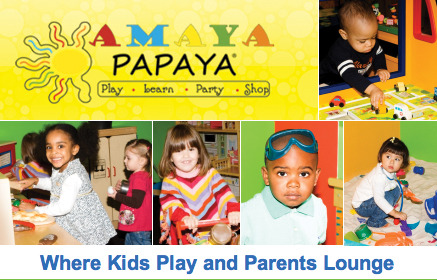 Amaya Papaya also offers numerous classes, events and hosts birthday parties. We all know that Florida's weather can be extreme and there are days when you want to go outside and play with you little one but the 100 degree weather, humidity and chances of heavy rain before 12pm stop this from happening. Thankfully Amaya Papaya is here to enjoy! Amaya Papaya and I have teamed up to giveaway 3 free admission cards! To enter the giveaway you only have to do 3 things! Update your Facebook status with your favorite post and tag me OR Tweet your favorite post and tag me in it. Lastly, leave your contact information be it Facebook, Twiter or Email in the comment box below.